In an endeavor to celebrate the Birth anniversary of Hockey Wizard Major Dhyan Chand on 29th August as National Sports Day in India SRM University, Delhi-NCR, Sonepat, Haryana organized a Tribute ceremony and an exhibition match for the students, faculty & staff on 29th August 2017. The session was joined by Hon’ble Vice Chancellor, Registrar, Dean’s and other faculty & staff members of SRMUH. Hon’ble Vice Chancellor Inaugurated the session with word of wisdom and paid tribute to Major Dhyan Chand. The faculty, staff & students were educated on the importance of Sports and Motivated from the life event of Major Dhyan Chand. 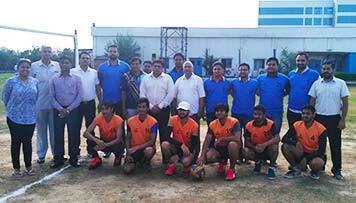 The Volleyball exhibition match was played between Staff & Students of SRMUH under the guidance of Mr. Pardeep (Volleyball Coach) followed by prize distribution and high tea. 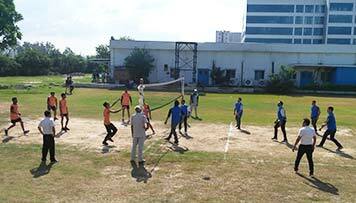 The event was headed by Dr. Amrish Tony (Deputy Director) and Ms. Sonia Bathla (Assistant Director).